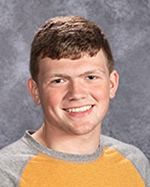 ANTWERP – Brett Fulk, a senior at Antwerp High School, was recently named the school winner in the Wendy’s High School Heisman Scholarship Competition. To apply for this, students must be graduating with the class of 2019, have a cumulative high school grade point average of a B (3.0) or better, participate in at least one of the 47 sports recognized by the National Federation of State High School Association and be a leader in his/her school and community. The Wendy’s High School Heisman was created by Wendy’s founder Dave Thomas in 1994. Twenty-five years later, Wendy’s High School Heisman has honored more than 600,000 of the nation’s most esteemed high school seniors who share Wendy’s values of giving back to their communities, treating people with respect, continuing education and excelling on the athletic field.